A reminder always for myself, the depth in which Prophet (sallallahu alaihi wasallam) brought the realities onto the earth. And they are the secrets of the heavens and a link into the material world. It means the mulk and malakut, all of its realities Prophet (sallallahu alaihi wasallam) brought. Many focus on only the material understanding from the mulk, and very few seek out the mulk but more important from malakut, the heavenly realm, the reality which is eternal. Means that when we are seeing the events of hajj and the difficulty at the hajj, that Allah ‘Azza wa Jal’s Rahmah be on all them and all their families and grant everyone sabr and patience for all of these calamities that are happening. 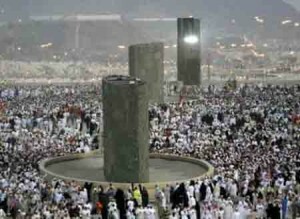 A reminder for the jamarat, which you see the 3 symbols of shaytaan, that they are 3 forms, what are they called, obelisk. [The pharonic thing that goes up with has a point at the top], those were 3 symbols of shaytaan. One understanding, these were the 3 attacks that came for Sayyidina Ibrahim (alaihis salaam) to block from fulfilling his order from Allah ‘Azza wa Jal. A more eternal understanding is that every heart has 3 locks on it. Because these are related to the oceans of faith, that when you understand that Allah ‘Azza wa Jal sent the example of the Prophet Ibrahim (alaihis salaam) as a symbol of faith. And the steps that we re-enact, it’s from mulk, from the material world; but more important, it’s symbolic of the spiritual realm. Means one is that you walk and go through all of the form but more important and why it’s the last pillar is to understand why you’re doing those. So that to have had a spiritual understanding, a physical understanding. So that when you walk that path of pilgrimage, you’re making it a lifelong walk. We never stop walking our pilgrimage. It’s not you buy a fancy ticket and you make one pilgrimage but our life is a consistent and continuous pilgrimage to the Divinely Presence. Those 3 jamarats, we know that when there is going to be difficulty in Makkah, imagine when they get to the jamarats what’s going to happen. ‘Cause Makkah got hit by lightning (Sept 2015). That should be a big sign for anybody’s who’s watching, Allah’s not happy. Lightning hit the crane, the crane caught on fire and, God forbid, people got hurt. If that happens at Makkah, then we should imagine what going to happen at jamarat, where, God forbid, 2000 people- I think they’re still counting- passed away. 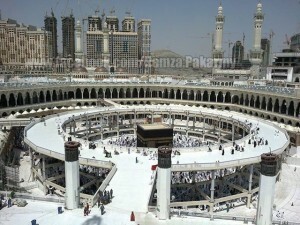 Jamarat– because symbolic of throwing the stone at shaytaan. And he’s not happy you are throwing stones at him and immediately he causes a difficulty as a counter. For us the symbol and an understanding of the eternal reality is that these shaytaans, they are blocking the heart from the light of faith and that our path is based on opening the heart. 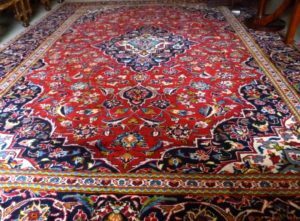 When we understand all the tests that come, all of our life experiences, if we put them all together like a carpet, and this beautiful carpet that is symbolic of our Eastern culture is a series of knots; knots- difficulties. If you put these knots at any point in time, you think of them as just knots; “I don’t understand how this is going to come together to anything worthwhile.” But the One who’s weaving it, knows. 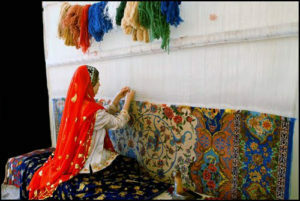 And after they weave it and weave it and weave it, you’re astonished how they came up with this pattern. When you look at the pattern, it’s not by machine. Somebody on the other side is just tying a series of knots and it comes together with such an amazing colour and pattern and design that most people can’t draw it by hand, more or less draw it the reverse and not seeing it. You know, they see the loom is something they don’t see. They just take the colour and they keep tying and tying and all of a sudden this forms an amazing pattern. And that is our life’s example why they are part of our culture is that any time that you feel that you’re being tested too much and difficulties too much in your life, you look down and say, “God must have a plan for me. There must be a plan in which these knots are forming something beautiful.” And that becomes our life and our life’s adventure on this earth. That every heart has 3 locks on it- 1 lock that blocks their hearing, 1 lock that blocks their eyes, and then the third is the veil, what you see over the Holy Kaabah- ‘cause the Kabah is symbolic of the heart of the believer- that there’s a khiswah, a veil upon the heart; that until a lock from the hearing comes off, the lock from the vision comes off, the khiswah (veil) cannot be removed. Means the true state of the believer and the true state of spiritual vision, not the vision of imagination, but the true vision that they are describing. It means these 3 locks have to be removed. The first lock [is opened with], ‘sami’na wa ata’na’– I hear and I obey. Every aspect of their life is they hear and they obey, they hear and they obey, they hear and they obey. And that is a very difficult process- very difficult to hear and to obey. That is the only way to open that lock. They teach that if that station is not reached, then nothing can be opened. Whatever somebody thinks they have is from the world of imagination and people can imagine all they want. But what they’re talking about of the heart in the Divinely Presence is like going through airport security. They are going to search everything. The angels are going to search everything- everything about the characteristic. Because what we are talking about of an open heart is an eternal dress upon the reality of that insaan (human being); a dress in which Allah ‘Azza wa Jal, when He begins to grant, He never takes back. Means then the first lock that all the turooqs [Islamic spiritual paths] understood was ‘sami’na wa ata’na’– they have to hear and obey. So then everything about their class and accompanying them is from listening and following, listening and obeying, listening and obeying. Whether they listened to the presence of the shaykh by keeping the company of the shaykh or listen to the lectures and the talks and all of the teachings. And then applying that into our life and however difficult it becomes because, what God wants for us and what we want for our self are very off. That’s why ‘Thy kingdom come, thy Will be done, on earth as it is in heaven’. The kingdom of God to come into the heart of the believer is not something easy and it’s not something small. And when that kingdom comes, His Will shall be done at all times. That’s why then complete tasleem and submission, because the Will of God becomes more and more difficult to carry as the darajat and the station of that servant is being raised. What He wants for you as a child- something different; what He wants for us as a teenager- something different. What He wants for somebody that’s mature- completely different and it may have nothing to do with our own personal will, what we want, and hence the difficulties. Those who live and understand, they are astonished at times, at what type of tests come, what type of emotions come, what type of difficulties come and you basically bite down and keep going. And that’s to hear and obey. Imagine from their stations where they are hearing the orders of the Divine, regardless of what their family cares, regardless of what their friends care, regardless of what their community cares, they hear it and they do it. 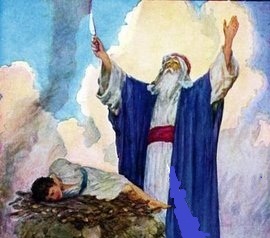 And if the whole community began to throw rocks at them, which you have the lives of many saints like that, because they [people] couldn’t carry the understanding of what this person is doing. That person may be in the ocean of complete tasleem (submission). Where Allah ‘Azza wa Jal give them an order that make them to go through difficulty – a difficulty that nobody can understand but Allah ‘Azza wa Jal and Sayyidina Muhammad (sallallahu alaihi wasallam), the one who’s sending that isharat and sending that guidance to the heart of that servant. So means that everything in our lives and as we’re passing these events of the 12th month and opening a new journey on the 1st lunar month of Muharram, where the whole journey begins again. But a reminder always for myself that everything is based on removing that lock. So then all their teachings come to remove that hearing, remove the block that’s blocking that hearing. Then they begin to teach that if you’re removing the block of hearing, then what you’re looking to see is not going to be in this room. There’s nothing of importance within the room. It means that you begin to take the practice of opening your spiritual vision by contemplating and annihilating one’s self that, “I’m nothing, I’m nothing, I’m nothing. My Lord, keep me in the presence of those whom You are pleased with.” That as much as we think of something of ourselves, it’s very difficult to annihilate. ‘Cause too much of the self is there and it doesn’t want to go away. Like a, in our way it’s important to be given the khirqa [robe] of the shaykh, that when he dresses you from his robe means it’s symbolic of he has dressed you from his light. What God has given to him, what Prophet has given to him (alaihis salaam), he’s giving to that student as a dress of light and a dress of protection and a dress of accompanying. Means that when you visualize that dress, that, “My Lord, let me to be nothing. 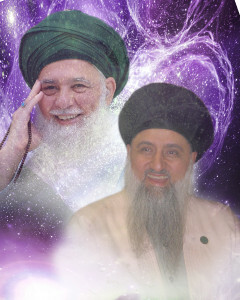 Let me to be in his presence and Sayyidi (my master), dress me from your light. Dress me from your dressing. I’m nothing, I’m nothing,” and you take a lifelong path of being nothing, being nothing. Being nothing and then asking to visualize his light upon my light- not worshiping him. It has nothing to do with worshiping. Worshiping is only for God, but to be dressed from that light, blessed from that light that your presence is in their presence. Take me like a dot, like a dust in your jubba and you go with them to be khashia’, to be like a dust in their presence. Means if we can achieve the lock of hearing and submitting, achieve and begin the practices of annihilation and opening the spiritual vision, then Allah ‘Azza wa Jal begins to lift the curtain, which is their firasah and their spiritual vision. 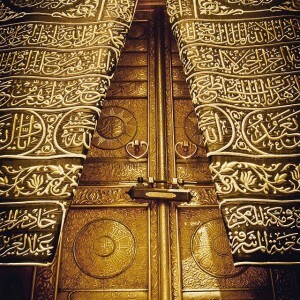 Means that curtain begins to lift and that is the reality of the Holy Ka’bah. 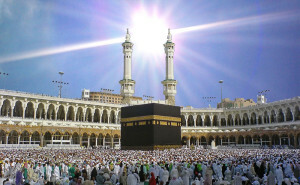 Means that Kabah represents the heart of all believers; it does not represent Allah ‘Azza wa Jal. Nothing- la sharik– nothing is like unto Allah ‘Azza wa Jal. Nothing has any resemblance of Allah ‘Azza wa Jal. It is a symbol of Divine Light and energies that are emanating. And what’s the most holiest light that could be emanating is the light of Sayyiduna Muhammad (sallallahu alaihi wasallam) must be there. 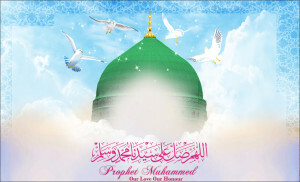 The arwah and the soul of Prophet (sallallahu alaihi wasallam)- the soul and the light of the soul can be many places. Light is not form. They take a light, they put it there, they take a light, they put it here and all of that light communicates with its original source. Means that there must be a spiritual presence of Sayyidina Muhammad (sallallahu alaihi wasallam) in the holy precincts of the Kabah that give it its spiritual reality, and as a result of the holy presence of Sayyidina Muhammad (sallallahu alaihi wasallam) at the holy Kaabah, Allah ‘Azza wa Jal sends a rahmah: “Wa ma arsalnaka il-Llah rahmatal lil ‘aalameen”. So if Allah’s tajalli is there, means that the nabiyeen, siddiqeen, shuhadaa’i was saaliheen– all their arwah must be located in the holy precincts of the Kaabah. And that’s what makes it be holy. That’s what makes Allah ‘Azza wa Jal’s nazar to be on the holy Kabah because of the light that it represents. The one inside is more difficult to see. The reality outside is easier to see. Say “Oh look, if this is the state of the believers,”- you’ve seen all the construction, that’s got now like freeway going around it, 4 different levels of highways and roads and cranes, like 50 different cranes and then hotels that look like they’re from cartoon shows, from ‘Lord of the Rings’. And a clock, that above everything. Instead of making tawaaf they’re looking at the time. And when adhaan goes off they look up at the clock and then there’s a big emanating light that’s shining everywhere. This is a distraction for the believers. This is a state of distraction in which they say, “Look ya Rabbi, our hearts have become overcome,” – overcome with dunya desires. So means they come into our life and teach: don’t put anything in your heart other than Allah ‘Azza wa Jal. Don’t put your kids into your heart; don’t put your spouse into your heart. Your heart is only for the love of Sayyiduna Muhammad (sallallahu alaihi wasallam) and love of Allah ‘Azza wa Jal. Everything else put into your liver- we say ‘Jigar’. Do you also have in your custom ‘Jigar’? When they would look at the kids they say ‘Jigar’. If you said in your heart, something may have come to that child, especially if Allah loves you. If Allah loves you and sees that whatever you have preoccupied within your heart, it’s making the one who loves you uncomfortable with you. Just like in our own relationships. In our own relationships we expect 100% loyalty. What Allah ‘Azza wa Jal then thinks? Say, “I love you so much,” especially those who know themselves to be close with Divinely Presence. They have an extreme love for Allah ‘Azza wa Jal. We must know that Allah ‘Azza wa Jal has an extreme love for us. They teach then: don’t put anything into that heart. Don’t even talk that way because they’re also hearing. They can hear what test needs to come just by the words of your mouth- what you say you like and what you say you want- those angels are, “Huh? 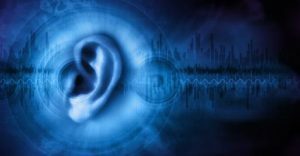 Let’s send a new test.” They hear everything. 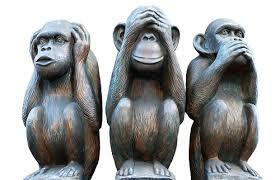 So then they teach us: keep quiet, otherwise the test will come for something like that. Keep the love of loved ones in a different location. And try to purify the heart that nothing enter the heart but the love of the Divine and the love of Sayyiduna Muhammad (sallallahu alaihi wasallam). So that Allah ‘Azza wa Jal doesn’t call us to test, as he tested Sayyidina Ibrahim (alaihis salaam). Means that all of this has an eternal reality- it’s not just people buying a ticket and going around a structure and then throwing rocks. Then the news making fun of all these people in towels and throwing rocks at something. But it has to do with an eternal reality that is extremely deep reality. And the rocks that they throw and the number of rocks are all significant. And that in our lives, we have to take a path of throwing rocks at shaytaan. Means casting out the devil, constantly taking a path in which you cast out the devil. Casting out these devils, casting out the satanic way and seeking always refuge in Allah ‘Azza wa Jal from every shaytan and every difficulty. And what does the TV teach people? The vampire series teaches all these young girls, that a handsome vampire is coming for you to fall in love with. This is the opposite of A’udhu Billah. That’s what he wants; he wants to teach. We sit with the kids and we’re watching the shows! And shaytaan teaching on the show. And the shaytaan, the devil, the vampire comes to the door- they make the vampires handsome so that every girl is thinking, “Wow, I hope like a handsome vampire comes for me.” A’udhu Billah! The vampire comes to the door and says, “I can’t enter,” now teaching Islamic values. So then all of this and all of these media is teaching how to invite difficulty, how to invite devils, how to invite every type of harm into our lives. And what Prophet (sallallahu alaihi wasallam) brought for us was ‘ A’udhu Billahi Minash Shaitanir Rajeem’. Our life is just the understanding of seeking refuge in Allah ‘Azza wa Jal from every type of satanic understanding, that before you even open the door of ‘Bismillahir Rahmanir Raheem’. And everything today is based on bombarding, bombarding, bombarding: break that A’udhu Billah. From every music they hear is to break the A’udhu, from every television show to break the A’udhu. From every interaction with people to break the covenant of protection and to invite harm and difficulty upon themselves. That’s the importance of the jamarat. It’s not like a comedy but it’s a deep reality of our existence and that every time you fight shaytaan, he fights back and hence the horrible calamity. That these are difficult days that are opening onto this earth. 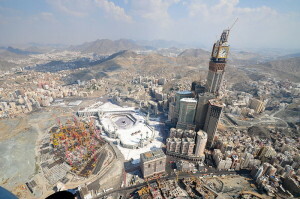 A sign of these difficulties is that what a difficult hajj this was this year (2015/1436 H.): hotel burned, tawaaf was destroyed by lightning, the jamarat– 2000 people. And this for the people whom Allah ‘Azza wa Jal loves. Imagine those whom Allah ‘Azza wa Jal not so in love with because of bad character and bad desires and bad actions. We pray that Allah ‘Azza wa Jal always inspire us towards goodness, towards cleanliness, towards that which makes His Divinely Presence to be happy. And that His Kingdom come within our hearts and that His Will be done within our hearts and that our will be nothing, nothing, nothing day by day, InshaAllah.